Welcome to Day 3 of Cookie Week. 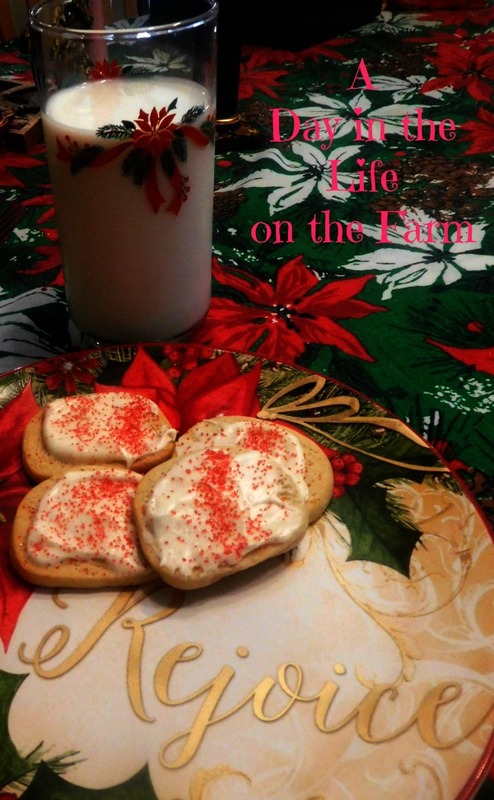 I hope you have been enjoying the tons of cookie recipes being shared. They all looks so mouth-wateringly delicious. I can't wait to try some of them. Thanks Ellen of Family Around the Table for hosting this amazing, week long event. Knowing that I wanted to combine these two events and having already shared Gingerbread Eggnog Cups a few years ago, I went in search of a cookie recipe containing eggnog. I found this recipe at the Taste of Home website. I made a couple of very slight adaptations. First, I halved the recipe and secondly, I sprinkled on some red sugar to make them a little more festive. In large bowl of stand mixer, fitted with the paddle attachment, cream together the butter and sugar until light and fluffy. Add the eggnog and beat until combined. Turn the beaters to low speed and stir in the baking soda and nutmeg. Gradually add the flour until combined. Increase the speed and mix well. Divide the dough in half. Shape each half into a 10" roll, wrap in plastic wrap and refrigerate overnight. Unwrap the dough and cut it into 1/4" slices. Place an inch apart on baking sheets lined with parchment or silicone mats. Bake in a preheated 375* oven for 8-10 minutes. Remove to wire rack and allow to cool completely. I always forget about the colored sprinkles and I have tons of them in the pantry. The red adds such a lovely pop of color! I see we had the same idea in combining events! The sprinkles do make them very festive. I think the sprinkles were definitely needed. They should be a requirement on all holiday desserts. So I saw the preview to these on your facebook page, and then when I came here to check it out I see they are part of an eggnog extravaganza?!?! Yes! Fabulous! These sound delicious! Both the cookies and the frosting! Great way to combine the events. 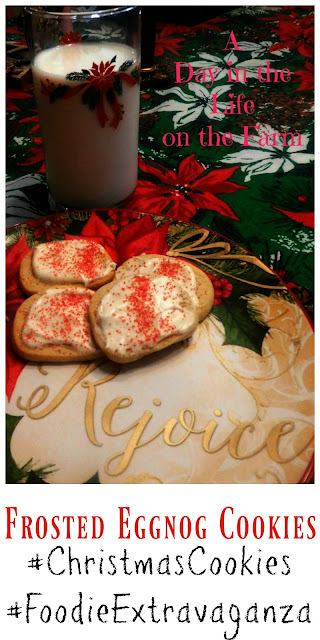 I love the sound of these - frosted cookies are always such a tasty treat, and eggnog everything makes me happy! Then you will really enjoy these Rebekah. Beautiful festive cookies to bring in the Christmas season. Thank you. Merry Christmas Sneha.